I came up with the idea for this blueberry tart recipe when I was driving back from my annual pilgrimage to a blueberry farm, while popping fresh berries in my mouth. There's truly nothing in the world better than organic fruit picked fresh off a vine, but it's fun to doctor that fruit up into fancy desserts. 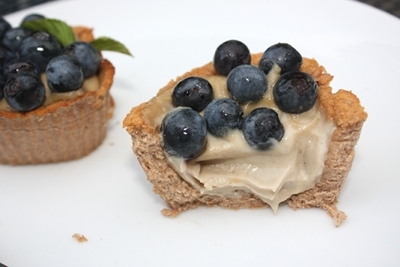 This fruit tart recipe also happens to be a raw vegan recipe as well. I love the delicate flavor and texture of pastry crust, but blueberries tend to correspond to wickedly hot weather, when the last thing I want to do is turn on my oven. If you prefer a cooked crust, you could make one and use just the pastry cream recipe and top with the fruit. 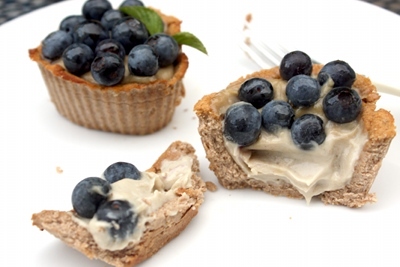 You can also turn this from a blueberry tart recipe into a strawberry tart, kiwi tart, peach, strawberry-banana, or any other kind of tart you please by simply substituting in other toppings. I tried to use almond okara (the pulp that's left behind when you make your own almond milk) for the crust in this recipe, but I found it make a weird, soft texture and I didn't get the flavoring right. Instead I recommend following the recipe and using ground nuts, which gives the crust a sturdier texture. You can also switch out other kinds of nuts in this recipe; walnuts, macadamia nuts, and pecans make nice substitutions. Serves 4 with one small tart each. To make the pie crust, combine the okra, dates, and salt in a food processor and pulse until it's very fine. Press the crust into your tart pans, making sure to press it into every crevice. I like to put the tart crust into the freezer at this point to allow it to harden and fully stick together, but you could also fridge it until you're ready to fill. To make the filling, combine the cashews, dates, agave, lavender, lemon juice, and salt in a strong machine like the Vitamix and blend until it's really smooth, about 3-5 minutes. Taste for sweetness, and if you prefer a bit more sweetness, add another date or a bit more agave. 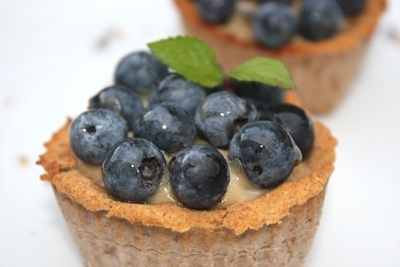 Fill the tart shells with the pastry cream and then place them in the refrigerator for 30 minutes - 1 hour. When the pastry cream is set and firm enough to hold the berries without collapsing, you are ready to top the tarts. Arrange the berries on top of each tart. Put the agave syrup in a small bowl and use a pastry brush to lightly glaze the tops of the berries. If you don't have anything to brush the berries with, you can just spoon the agave onto the berries.